Aluglass Bautech offers a wide range of acoustic solutions for designing high-end homes – including flexible glass products, to partitioning and sun control. Today’s home owners want comfort and a space that works for their lifestyle. With the efficient use of space top of mind, what better than a space that can adapt to their changing needs? With Aluglass Bautech’s partitioning wall systems, living arrangements can easily be reconfigured between open plan and privacy, even creating a home theatre space. Essential for acoustic comfort within an audio-visual room, Fabricmate absorption panels can either be fixed to the ceiling or on the walls to reduce unwanted reflections and echoes. These panels can be finished in colours and fabrics available to suit the décor. While, Variflex mobile acoustic partitions, available in heights of up to 12m, are ideal for creating a private acoustic room in combination with a Varikust acoustic door. The partitions are top-hung (no floor track required), which means that when the elements are parked neatly to one side of the room, the floor has an uninterrupted finish. For the bathroom sanctuary, clean lines and quality finishes add sophistication to the space. Aluglass Bautech’s Showerflex range of frameless and semi-frameless bathroom solutions is custom-made with either solid brass or stainless steel fittings, which minimise the risk of degradation or discolouration. These include shower, bath and toilet enclosures, as well as room dividers and sliders with an extensive range of finishes. Glassflex sliding and folding doors help control the natural light in building interiors. Natural light flooding a space can be uplifting, but direct sunlight and heat need to be managed to get the perfect balance. Glass offers elegance coupled with insulation and acoustic properties without blocking natural light, while custom-designed blinds and awnings provide efficient sun control where necessary. These can be motorised and automated through the use of sun sensors, and adding design and material options for thermal comfort. Sometimes, only glass will do. It is glass alone which offers elegance, privacy, insulation and noise solutions without blocking out natural light. Aluglass Bautech Glassflex® offers a TURNKEY glass and glazing solution with a number of products under its umbrella giving any Architect and Designer the value add in quality, functionality and durability. 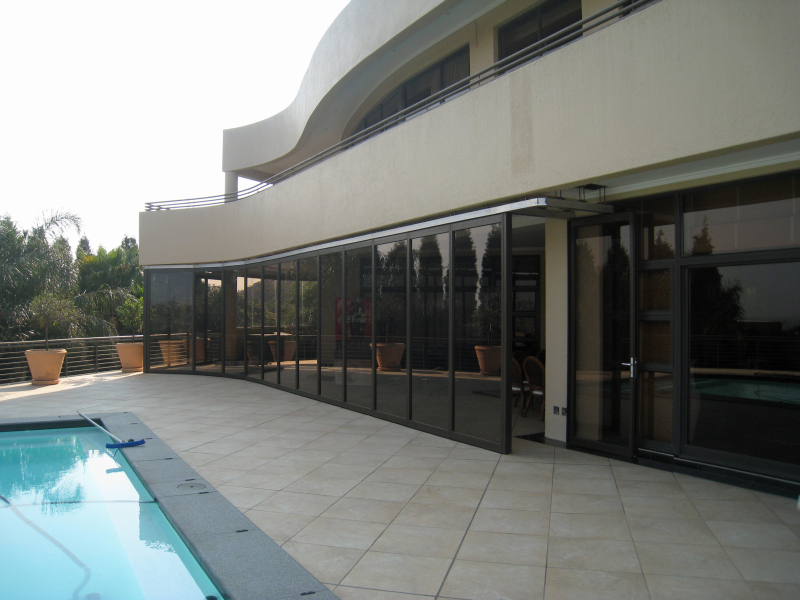 The product range includes: Fixed Flush Glazed Facades, Frameless Glass Doors, Flush Glazed Curtain Walls, Aluminium Framed Windows, Sliding Folding Doors. Aluglass Bautech glazing products conform to prescribed safety standards and manufacturing specifications, and proudly associated with AAAMSA, SAGGA and SASEMA. It is important to note that even though Aluglass Bautech products have excellent acoustic properties, sound can also travel through ceilings, walls and roofs, so to completely block out the noise of traffic, neighbours or other outside stimuli, it is advised to involve an acoustic consultant to do a feasibility study and provide a holistic proposal in this regard. 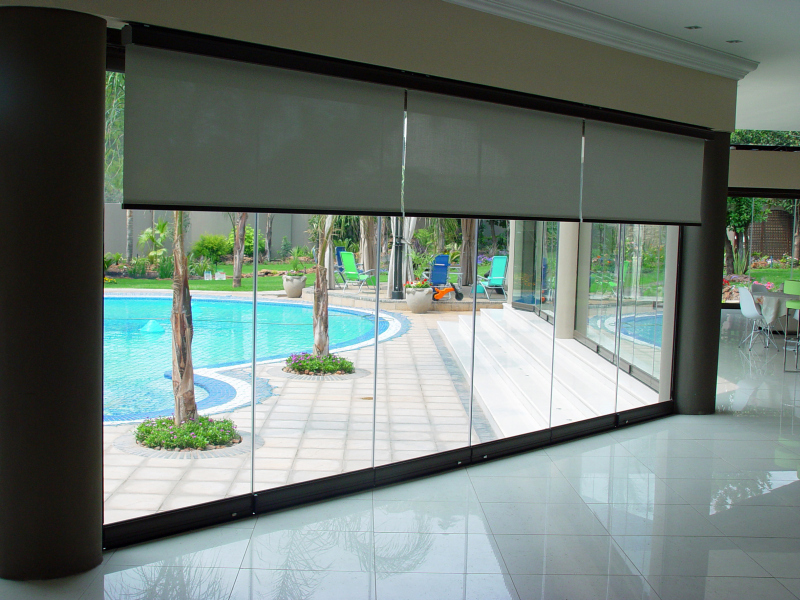 Caption main image: Solux blinds can be motorised or remote controlled, and advanced time regulation or sun sensor systems can be integrated into the building management system. If you enjoyed this article, sign up for our newsletter: http://www.buildinganddecor.co.za/register/. Subscribe to our free magazine at www.freemagazines.co.za.